Have you ever eaten something and wondered exactly how it came to be? What was the person thinking of when he or she salted shredded cabbage for the first time and let it sit for several weeks? I don’t think sauerkraut was the intended outcome, but certainly a culinary condiment and probiotic we have come to depend on. Imagine taking an egg and perhaps accidentally spilling olive oil in the bowl and, after stirring crazily, this white and creamy concoction develops. Add a splash of acid and some seasoning and, hello, mayonnaise. How long did it take for someone to figure out how to take green coffee beans, roast and then grind them into a dreamy, comforting and absolutely addictive cup of coffee? Sometimes when I read cookbooks, magazines or food-related websites, I wonder what propelled a person to combine certain ingredients and even question their process. Faith in the recipe’s author is mandatory, which is the only reason I often try dubious recipes that don’t seem like they would work. But they do. That’s what I was thinking when I came across this particular recipe from theKitchn.com, one of my top five favorite culinary sites. They offer a diversity of information that I find readily applicable to my own cooking style and this recipe caught my attention as being something totally unique and healthy. Greens are popping up at farmers markets in South Texas and the first greens are always the sweetest, which took my enthusiasm over the top to give this recipe a try. Red onions soaked in Cholula hot sauce. 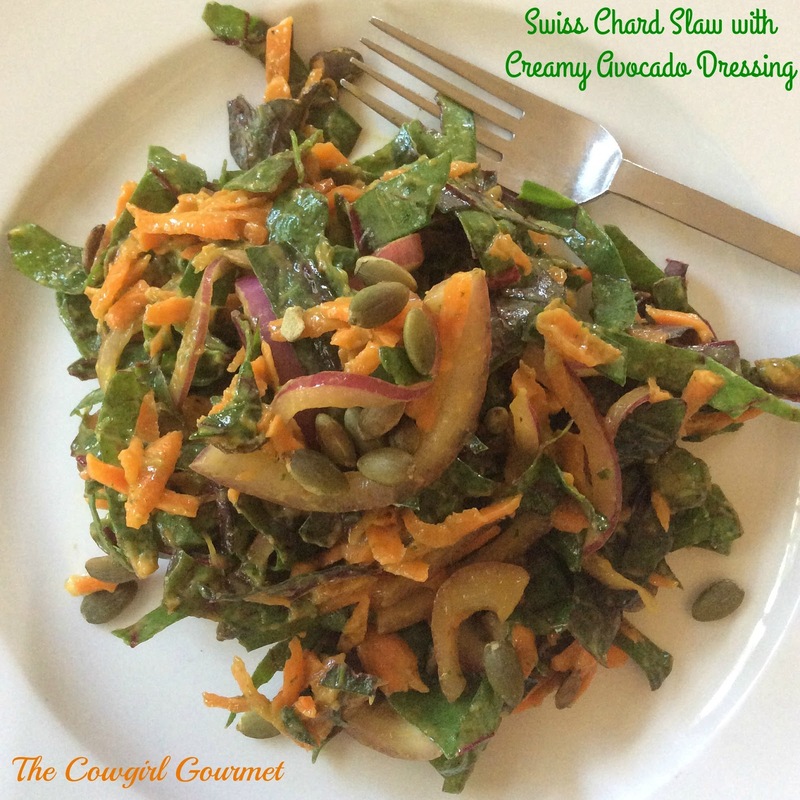 Raw, thinly-sliced Swiss chard paired with shredded carrots. Creamy avocado-cilantro dressing packed with flavor from a little cumin and lime juice. Toasted pumpkin seeds offer a slight crunch and earthiness. A truly delightful side that is simple enough to let the protein shine but flavorful enough to give everyone at the table something to talk about. The trick to this slaw is to make the dish right before you are ready to serve–and eat it right away because the leftover slaw was not as particularly fabulous, though we did eat it. The reason this recipe is a winner? First, I trusted the source, loved the simple ingredients and was most intrigued by the hot sauce infused red onions and anytime anyone suggests avocado, I am in. For such a simple dish, this slaw really packs a heap of flavors and textures. This is why I am confused when people say healthy food is bland. Clearly, they have been missing out. Though spring and summer is the time we most enjoy coleslaw, this fall recipe celebrates the arrival of greens which takes this dish to a whole new level of love. Swiss chard and carrots add texture and color while the hot sauce infused red onions give just a kick of heat and the creamy avocado adds richness to this autumnal slaw. Place the sliced onion in a big bowl and add the hot sauce. Stir to combine and set aside. Remove the stems of the chard and then wash and dry well. Stack the leaves on top of one another, roll them up like a cigar and thinly slice crosswise into ribbons. Transfer chard to the bowl and gently place on top of the onions. Do not mix. Grate the carrot on a box grater and then add them to the bowl as well. Set aside. In a blender, scoop both halves of the avocado, lime juice, cilantro, water, cumin and 1/4 teaspoon salt. Season with some freshly ground black pepper and blend until smooth. Taste and add more seasoning or lime juice as needed. Pour half of the dressing into the bowl of onions, chard and carrots and toss to coat. Sprinkle with the remaining 1/4 teaspoon salt and some more pepper and taste, adjusting seasonings if needed. Sprinkle with the roasted (in a 375 degree oven for about 10 minutes) or toasted pumpkin seeds (in a dry skillet for about 5-7 minutes or until they pop and turn golden). Toss to combine. Transfer the slaw directly to individual plates or a serving dish and top with a few more pumpkin seeds after plating. This recipe can serve as a side salad or as a main dish by topping it with a protein of choice. The salad is best eaten the day it is made. Any remaining dressing can be reserved and refrigerated for another occasion, but use within 2 days. This recipe yields 3/4 cup dressing, which is more than this salad will need. Refrigerate any leftovers and use within 2 days as dressing or a dip for raw veggies.